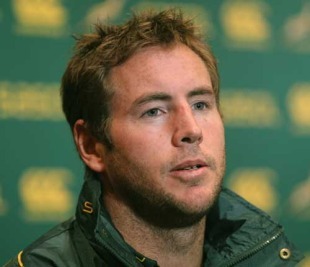 World Cup winning fly-half Butch James has retired from international rugby with immediate effect. James was named in Heyneke Meyer's first planning camp ahead of their three-Test series with England this summer but the former Bath half-back has opted to hang up his Test boots. James was an integral part of the Springboks side that took the 2007 World Cup and also guided Bath to Amlin Challenge Cup glory in 2008. And although he was part of the South African side that reached the quarter-finals of the 2011 World Cup, James has now turned his focus solely to domestic rugby - where he currently turns out for the Lions in Super Rugby. Talking about his decision to retire from Test rugby, James - who has 42 caps to his name - said: "I've had a great career playing for South Africa, the Sharks, Bath and the Lions, but I'm not getting any younger and I knew this was the right decision to make, even though it was very difficult. "I think I've got one or two more years of rugby left in me and all I want to concentrate on at this stage is to give nothing less than 100% on the field and enjoy my game. I've been fortunate to have a long career playing at the top level and I'll look back at my time with the Springboks with nothing but fondness." Springboks coach Heyneke Meyer admitted he was sorry to see James retire but emphasised that he respects the half-back's decision. "Butch was an integral part of the Springbok team that won the Rugby World Cup in 2007 and he's been a great servant of the game over more than a decade," Meyer said. "He contacted me to inform me of his decision to retire and I respect that. "I really wanted to have him here with us, as he brings a wealth of experience with him and it would have been great for many of the younger players to work with him, but I understand that he wants to concentrate on his career with the Lions and I can't fault that."